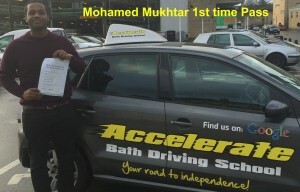 “I booked with Accelerate Bath driving school because of all the good reviews and they were easy to contact. I found learning to drive very steady and comfortab…le, my driving instructor Aaron was very easy to talk to and well informed. He made me feel at ease, I would recommend him because he is a good instructor”.